Cathy’s Note: Please welcome to Indie Gamer Chick Mr. Paolo Munoz, known here as Indie Family Man. Both myself and Miko get a lot of requests to review indie games aimed at young children. I guess a lot of you developers were influenced by the Carmen Sandiegos, Reader Rabbits, and Oregon Trails of the world. Although Mike and I get accused of being childish all the time, we’re not exactly the right people to be critiquing educational games for wee-ones. Paolo is a father of three kids, ages 9 to 1, and he enjoys playing games with them. Not only is he an excellent critic himself, he can also gauge how well his children respond to games in both the entertainment and educational factors. He’s the perfect man for this gig. Like Miko and myself, he doesn’t take review codes, paying for all the titles he reviews here. This is his first ever review, and he’s looking for feedback on it. Also, make sure you follow him on Twitter. If you’re a developer of games for young children, you can request a review from Paolo here. “Influent” follows the story of a young inventor named Andrew Cross. Andrew created a hand-held device he calls the “SanjigenJiten” which allows the user to point it at any object in the world and the device finds the word for the object in any language. Unfortunately, Andrew’s invention was stolen by an evil corporation, and it is the player’s job to help him prove that he is the true inventor. With the introduction to Influent, both my nine-year-old and six-year-old co-testers enthusiastically jumped at the chance to learn Japanese and to help Andrew in his quest. There is an amazing number of words you can discover in Andrew’s tiny apartment. The game has over 400 words that it introduces. My boys and I spent a lot of time finding out the Japanese names for common household items. Part of the fun of Influent is trying to find these words because so much of the apartment can be searched to find more things. Lots of pieces of furniture open to reveal even more items inside, such as cabinetry, drawers, and even the refrigerator. However, you are only able to explore items in Andrew’s apartment and cannot venture to the outside world. Despite the sheer volume of things you can click on (and there is a LOT of high quality assets in the game), I couldn’t shake the notion that the game feels “incomplete.” Influent suffers badly from a lack of gameplay and it completely abandons its compelling story and characters. The only available “game-like” mode is “Time Attack.” In “Time Attack” you take 10 words from a list and try to find them in the various rooms. However, you can create and organize those lists yourself, which can make tests incredibly easy. Moreover, a lot of Japanese words for household items come directly from English. So words such as “door” (do-ah), “curtain” (kah-ten), “computer” (kon-pew-tah), “keyboard” (ki-boh-doh), etc. are all over the apartment and are easy to understand. This can make “Time Attack” challenges too easy and not very good for language retention. “Mastery” of a word can be achieved by simply repeating “Time Attack” three times for the same set of words. And, the only variation to the game play happens after you “master” 50 words. It unlocks a tiny, infuriating, crash-prone remote control airplane that you can only use while doing more “Time Attack” exercises. Learning Japanese is hard. “Orange” in Japanese is “orenji”. What I think is a bigger tragedy is how the character and story of Andrew Cross, the intrepid inventor, completely disappears from the game. The loading screen itself features Andrew, a spunky female friend, and a charming robot – all three of which are compelling and interesting characters. The robot only makes a brief and shallow appearance in the tutorial. The girl is non-existent in the actual game, as is a mysterious second female character in sunglasses who only shows up in the loading screens. It almost feels like these characters were intended to be part of the narrative, but the developers ran out of time in development. Who’s that girl? Why is she on the main screen? Another major oversight is that the handheld “SanjigenJiten” itself never once makes an appearance in the game. Andrew wanders around his apartment with no such hand-held device in his hands. In fact, the game never tells you what “SanjigenJiten” means. I only found out by digging through their original KickStarter page that it means “3D Dictionary.” It is as if the creators assumed you already have some background knowledge of the game’s development and crowdfunding history before even playing the game. So what happens to the corporate crony who stole the original invention? How are we progressing in proving Andrew is the original inventor? How does memorizing these words advance the story? The original and very compelling invitation to play the game is completely lost and never makes another appearance beyond the introductory video. I believe that Three Flip Studios has a good start with great art assets, an excellent sense of humor (tons of gamer references), and characters I want to know more about and discover. 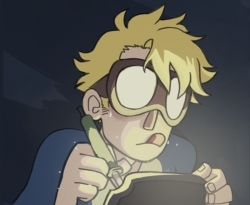 But Influent does not seem like a finished product. I sincerely hope that the developers continue expanding on what they have created. 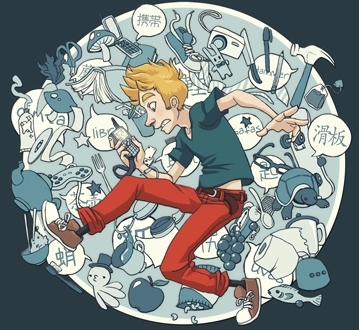 As it is, Influent is a neat language “toy”, but it isn’t a compelling game, nor is it as effective as a dictionary for learning words to common household items. 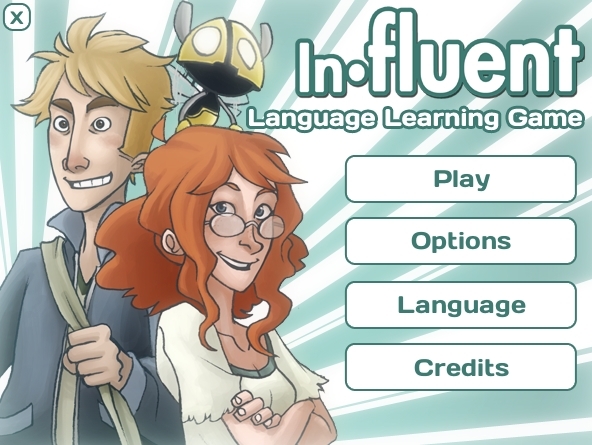 As of this writing, there are already 10 language packs available for “Influent” at $9.99 each, with dozens more planned. In my opinion, Three Flip should concentrate more on adding interactivity, story, learning challenges, and games, than simply adding swap-able audio files and text via DLC as an easy way of monetizing. $9.99 for a brief family distraction in a foreign language, but a good episode of Bakugan is more motivational for me and my sons to keep learning Japanese. Paolo is a busy father of three kids: two boys (9 and 6 years old) and a prodigious little girl (1.5 years old). Outside his home life, Paolo is a professional software developer of over 14 years who has always loved games, but just started getting into indie game development at the request of his boys.